The studio is clean again! Thanks to the startup of a new series of Monday night classes, I’m forced to keep things as tidy as possible, and I’m finding it’s a more inviting place. Somehow, just knowing there are no cobwebs in any of the corners makes me feel more creative and inspired. Another thing I love is hearing my students say how much they love being here. We have some laughs, some tea, lots of music, good lighting, and we actually manage to do some art in the process. The first night, to kick things off I bought a tray of assorted cupcakes. 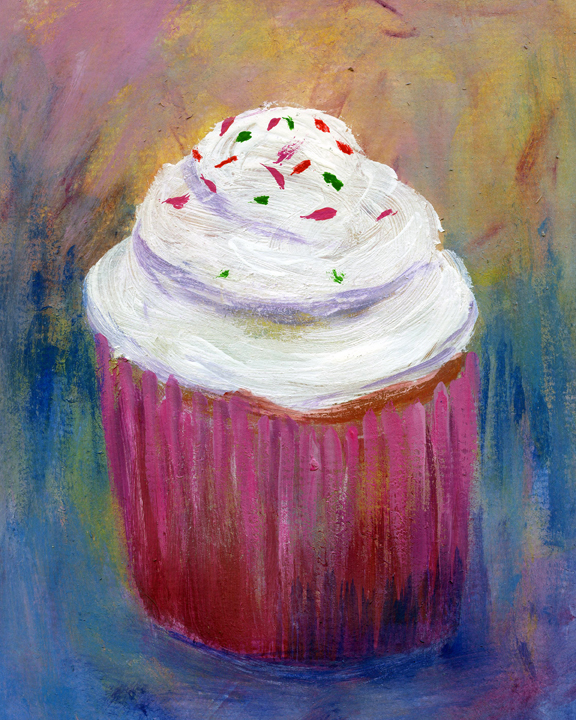 Each artist was asked to choose a cupcake, then paint it, then eat it (if she chose.) We had a fun evening. Here’s mine, complete with sprinkles. From there we will explore texture. This was just a fun exercise to get things going. It was a lot of fun, Pat! Especially since each cupcake was unique. I had a tray of six of them, and an ambitious painter could have decided to paint all of them together. But just one is great too. Shirley, I’ve never gotten really stressed out when my studio is messy. I don’t usually mind much as long as I have a cleared-off place to work. But I have to admit that I do love having the whole place nice and clean. And the energy is good on class evenings. I get some of it too, which is nice. Sounds great Martha. 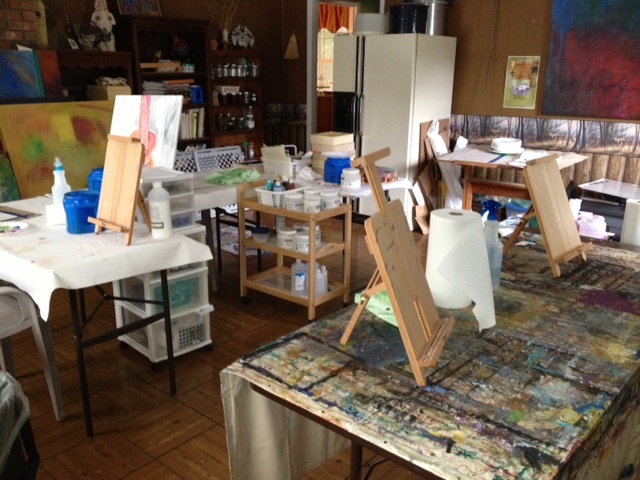 I like a clean(ish) studio, and a tidy(ish) one too, but I am not good at keeping it that way! Oh me either, Cath! I need to throw a dinner party to have a clean house. So guess how many dinner parties I have. So fun! It’s great to see how your classes took off! Hey, great to see you, Jennifer. Yes, we’ve been having lots of fun. Sometimes when the students are working and concentrating on their own stuff, I dabble around with something of mine. that sounds like such a fun/creative warm-up activity! We had fun, Sarah. I definitely recommend it.